I don't know what it's like to give birth to a child. I've heard it's pretty astonishing; the pinnacle of joy, when a child enters the world from your body and you see his face for the first time. But you know what? I am honestly, genuinely happy for my friends when they have new babies. Not a hint of jealousy. Because I have known an equal joy. Maybe it's not exactly the same emotion, but I guarantee that the intensity is the same. Gil and I returned last night from a whirlwind trip to Forever Angels, with the purpose of selecting our next son. The contradicting emotions of feeling both heartbroken and elated clashed against each other the entire time. The 50+ children at Forever Angels are treasured. Their pictures and hand prints line the walls. They eat well. They each have their own bed. The staff truly love these children and it shows in the way they interact with them. There are scads of short-term volunteers who bring games, songs, face paint, and bubbles into the children's lives. They do everything they can to show the children they are valuable, loved, cherished. But still, it is not okay. Because to live in an orphanage means a daily fight against invisibility, a daily fight to be seen. The children engage in this battle in a variety of different ways. Some have figured out that if they are the smiliest, cheerfullest, and most affectionate, they will get the attention they crave. Others fight--and they fight hard. When a stranger enters the playground, they run to get first dibs on her lap. If they succeed, they fight off--physically--anyone else who dares enter their territory. And if the lap-giver stands up, or gives another child a turn--they scream bloody murder. Others, I think, have just given up. One little toddler took a turn on my lap yesterday. When I moved her to give a turn to another, she cried a little, and then her expression filled with the most desperate despair. She sat with her back to me, motionless, for a long while. I held a baby in the tiny baby room--she was just a few weeks old. I filled myself up with a baby fix and then looked around, on instinct, for someone to give her back to. It was a harsh moment to realize that there was no one to return her to. I just laid her gently back in bed. Most children learn to say Mama or ball or no! as their first words. For these children, they learn first to say Me too! They yell it at the top of their lungs. These past two days, the children saw me as another lap to fight for, but they craved Gil even more. They rarely see men, so they were so excited to find a guy who would swing them around by their feet, wrestle them to the ground, and make them paper airplanes. Me too! Me too! Baba, Me too! They are beautiful, but many times I could barely hold back the tears. This is not how it should be. Children should not have to fight for attention. Children should not have to fight for a Baba to see them. They should not have to worry about becoming invisible. Yet our purpose there this weekend was to See One. To see the one who is supposed to be ours, to look up and say, You are the One. You are mine. I see you. Forever. It was only one, but at least it was One. And it was incredibly obvious to us. The decision was impossible because of all the others who were not chosen, but the decision was easy because we had no question that he was the One. All of a sudden, this One's life has completely changed. No longer will he need to fight. No longer will his future be full of uncertainly. He has been seen. He will become a Son. And he doesn't even know it yet. So when a mother talks about giving birth as a pinnacle of joy, I believe her. Because I've felt it too. It was one of those ordinary moments that suddenly becomes profound. A week ago, I was in the Shopper's Plaza parking lot, and my phone beeped. It was a text message from our social worker. Which orphanage do you choose? Forever Angels? I quickly texted back: Yes! I went into the store and starting my grocery shopping. The text kept swirling around in my head. Why would he need that information? He would only need it if he was writing our approval letter, right? But I was afraid to ask him. I was afraid to hope. After all, it's been three and a half years since we started on the journey to adopt a fourth child. We had to been told No more times than I can remember. In the past couple of months, we had been given reason to hope that maybe it would happen. But no one in social welfare had ever given us that assurance. I finished shopping, forgetting half of what I came for, and went home with my thoughts spinning. What are you waiting for? Gil asked me. Just ask him! So I did. I sent off the text: Does this mean you are writing our approval letter? And today, I was standing in the Tanzania Revenue Authority, getting our car registration renewed, when I got this text: I have good news for you. I have your letters for your fourth child. After three and a half years of waiting and longing and despairing and praying, This Day finally came. We have the letters in our hand. In the next few days, Gil and I will fly up to Mwanza in northern Tanzania, where we will try to get to know about half dozen adorable, perfect little boys who each desperately need a family. We will spend about 8 hours with these children, and then we will make our decision. It will be an impossible decision, an unthinkable decision. These boys are around 4-5 years old. We are possibly the last chance for each of them to get a family. Rejoice with us.....and then pray with us! After this trip, we'll still have a wait of about 1-2 months before we came bring him home. But regardless, there was a whole lot of screaming and jumping and dancing in the Medina home today. It finally happened. We were convinced it wouldn't, and yet here we are. Would You Ever Pay a Bribe? If you're like most westerners, you've never really had to think about it. You've probably never been asked for one. The temptation has never been there. It's a non-issue. For the majority of the world, the giving and receiving of bribes is commonplace. Happens every day, on every socio-economic level, in just about every aspect of society. Imagine your child's public elementary school teacher requiring him to bring a dollar to school every day, or else he won't be allowed to attend class. Imagine your high school student being required to pay off her teacher if she expects to pass her exams. Or worse, perform a sexual favor. Imagine running a printing business, but you never win bids unless you are willing to do the job under the table, tax free. It's complicated. Public employees are often grossly underpaid. Sometimes there's a fine line between a bribe and a tip. In America, we give tips after we have received good service; so is there a huge difference in giving a tip in order to receive good service? In some cultures, it's seen as the same thing. So where is the ethical line? These are difficult waters to navigate, that most in the West don't really need to think about. But for us, regular life. While living here, we have been asked for bribes, subtlety and not-so-subtlety, in a multitude of situations, more than I can count. As Christians, we should be absolutely committed to integrity. But is there ever a time and place when paying bribes is justified? What about Oskar Schindler, rescuing Jews? He paid lots of bribes. What about the people who are smuggling Bibles into North Korea, who regularly bribe border guards? Is that justified? There's probably no easy answer. Finding out about the American illegal international adoptions (often by Christians) happening in Tanzania shook me to my core. It's been a long time since something made me so angry. There is no way this is happening without bribery or other forms of corruption. And I am fighting it this week, by writing personal letters to agencies and families, urging them to reconsider. Yet I'm sure if I were face to face with these families, or with case workers from these agencies, they would justify what they were doing. Isn't it worth it to give a child a better life? What hope do these children have? What if they end up on the street? What if they have a condition they could die from in this country? Don't the ends justify the means? No. For me, this is an easy answer. And the difference between this situation and Nazi Germany, or North Korea, is that I still have hope for Tanzania and it's government. If paying bribes in those situations were justified, it's because bribes were used as a means of bringing down a government. Yes, there is plenty of corruption going on here. But I believe in the future of this country, and Tanzania's problems could be helped significantly by eliminating corruption, not contributing to it. Tanzania has adoption laws, and their goal is to protect children, so there is no reason not to follow those laws. Corruption brings down governments. Corruption breeds death. Rescuing a few children, at the expense of millions of others, is just not worth it. Would I love to see international adoption happening in this country? Yes, especially for special needs children. Does a lot still need to change? Is there still room for reform? Of course. But reform is not going to happen by enabling more corruption. We Americans wring our hands about poverty and child-trafficking and orphan care. Let's not make the problem worse by trying to help in the wrong way. If you ever hear of people pursuing a Tanzanian adoption who are not living here, please put them in touch with me. Josiah on Sports Day....God made him fast! This one's fast too! Won all her races that day. The night before the races, I asked her, "What's more important than winning, Lily?" She said, "Letting other people win?" U9 Girls' Soccer...and their fantastic coach! Grace ran her first 5K...at age 9! Josiah and Lily ran the 1K...and my little speedy, 40 pound 7-year-old boy took everyone down! Congratulations to my winners, and thank you to all who participated! Winners, please send me a personal message on Facebook with your addresses, so that we can send you your prize! I realize that many, many times on this blog, I have been an advocate for international adoption. I have been an advocate for Tanzanian adoption. I have wanted Tanzanian laws to allow more adoptions. I love Tanzania's orphans. I want to see more Tanzanians have a heart for adoption. I want to see Tanzanian churches and Christians step up in the area of orphan care and adoption. But let me make this crystal clear: I would never, ever advocate for someone to adopt a child, from Tanzania or anywhere, by going around the laws of the country. I discovered yesterday that this is exactly what is happening. There are American adoption agencies, and American families--Christian families--who are attempting to adopt children in Tanzania. Tanzanian adoption law is extremely clear. You must live in this country for three years before you can apply to adopt. There are no exceptions. You foster a child for six months, and then you apply to legalize the adoption. It always works that way. It's a slow process, it's a frustrating process, but it works. I am horrified...let me reiterate...HORRIFIED...to find out that there are American agencies and families who are trying to get around that process. The only way--the ONLY WAY--that is happening is because major money is being shifted around. I'm sure the families are in the dark about this. They are trusting agencies and orphanages who should know better. So when I see cute little fundraising pages for American (Christian) families who are raising money for their $30,000 Tanzanian adoption....the frustration, the outrage I feel just cannot be communicated in words. All three of our adoptions have been incredibly ethical. The process here is slow and frustrating, but it works. It is also FREE, other than lawyers' fees at the very end. So where do you think the $30,000 is going? What do you think that kind of corruption will breed? Sure, you give a kid or two a better life, but what happens when all adoptions in Tanzania are shut down due to corruption? I care about Tanzania's orphans, but I also care about Tanzania. I would never, ever endorse an adoption that will only breed more corruption, deceit, and most likely, child trafficking. Please friends, if you are pursuing an international adoption, ask the hard questions! Be wary of "Pilot Programs" in new countries! Be wary of small agencies who don't have much experience! Don't cut corners! It's just not worth it! Please, if you know anyone pursuing a Tanzanian adoption (who is not a resident of Tanzania), share this with them. My friends, let us love the orphan. But let us love truth and justice too. I'm only posting a cute orphan picture because I want people to click on this link. Because seriously, I'm not in the mood for impressing the world with cuteness right now. *Update January 2016: If you are considering a Tanzanian adoption and found this post through a Google search, please contact me. I have a lot more information that I would love to share with you. amedina(at)reachtanzania(dot)org. Please also consider reading the series I wrote on adoption corruption, starting here. I fell in love with Jim when I was 18. Elisabeth introduced me to him in her books. 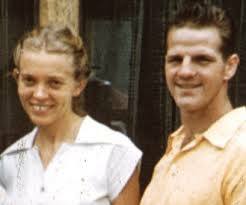 When I would tell my friends that I planned to marry Jim Elliot, they would roll their eyes and remind me that he was not only 50 years older than me and already married, but he was, um, dead. But I was not dissuaded. The bar had been set. I still put Shadow of the Almighty in the top 5 most influential books I've ever read. My life changed as I read Jim's story--a young man who was my age and yet totally and completely sold out for God in a way I had never seen or experienced. Elisabeth didn't put much of herself into her books about Jim, so I didn't start getting to know her until I ventured out into her other books. If I was in love with Jim, then soon after, I wanted to be Elisabeth. We are given the present within which to choose whom we will serve, knowing that this moment affects the next and we are accountable for it. Elisabeth was no-nonsense. Blunt. Witty. Very smart. Tough, but gloried in being a woman. She showed me what it meant to obey Christ. She wasn't into emotionalism or feeling sorry for herself. Her mantra was Trust and Obey. Period. Yet she knew suffering: She waited five years to marry the man she loved, and then three years later, lost him to Indian spears. She was a widow and single mom for 10 more years, during which she went back to the remote Indian tribe that murdered her husband. Her second husband died of cancer after four years of marriage. I think she earned the right to talk about suffering. Joy comes not in spite of, but because of, sorrow. Her faith was unwavering. Her joy was infectious. She still is the most inspiring person I've ever known. She is such a part of who I am that I have to remind myself I never met her in person. When I met Gil in 1998, not only was he full of passion and vision for the world, but he was a huge Elisabeth Elliot fan too. That was the clincher for me. I had found my Jim Elliot. Elisabeth died yesterday, June 15, 2015, a good and faithful servant. May her death remind another generation of young people they need to be inspired by Elisabeth and her Jim. It is nothing short of a transformed vision of reality that is able to see Christ as more real than the storm, love more real than hatred, meekness more real than pride, long-suffering more real than annoyance, holiness more real than sin. I started this blog in January of 2007....eight and a half years ago. Grace had only been home for two months, and my first post was about how my name in Tanzania had changed to "Mama Grace" once I became a Mom. It's still a name I relish. This blog was named after her, back when Grace was actually little. But also because Grace is my favorite word in the English language, and everyone really does need a little grace in their lives. Or a lot, actually. For a number of years, I mostly chronicled our lives in this space. Over time, I got more reflective. I have always loved writing, as demonstrated by the dozens of journals I kept through my childhood. My favorite class in college was Advanced Composition. But still, my readers were primarily family and friends who knew me. Then, two and a half years ago, one of my former education professors from The Master's College, Dr. Adams, submitted this post to Tim Challies, a popular Christian blogger. He linked to it, and for the first time, I was getting thousands of hits instead of dozens. Since then, he's linked to my posts lots of times, bringing me many more regular readers. It's been intimidating to realize that there's people out there who don't know me, but want to read what I write. Writing publicly like this feels a little like those dreams where you look down and realize you are naked. And I often post with fear and trembling, knowing that the internet is not always very friendly to its writers. I realize my blog is still a very tiny fish in a gigantic sea, and I am content with that. But I just want to thank you today, for reading and commenting and sharing what I write. I am truly honored and humbled. Your encouragement has spurred me on think more deeply and write more carefully. I am so thankful for you! I love writing, but I hate technology. I don't get web design at all. A couple months ago, it took me about three hours to get the Facebook box linked to my blog. When I finally figured it out, I realized it should have taken me five minutes. Yep. Dumb. So I was extremely grateful when the talented Suzanne Hodson of Olive Branch Studios in San Jose agreed to design a header for me. It looks fantastic, and I feel so professional now! So, in honor of my brand spankin' new header, and to thank all of my faithful readers, we're going to have another drawing! I sent three pairs of Tanzanian salad tongs back with my Mom, and she is ready to send them off to my winners! Bloggers love knowing who their readers are, so I've got to do something to coax out those lurkers. But even if you don't come out of hiding, thank you so much, to all of you! Believe it or not, there really are still orphans in Africa. If you follow international adoption news, you've heard it: Birthparents are manipulated into sending a child to an orphanage. A mother is promised money to give her sweet one up for adoption. Paperwork falsified. People who know better making way too much money off of a child's plight. Adoption mends. Adoption redeems. Adoption brings hope. Except when the brokenness breeds more brokenness. What kind of a world do we live in, where men exploit a child who has already lost everything? Where people prey on other's poverty, ignorance, hopelessness? I read articles this week on Uganda's adoption program, which seems to be the next African adoption program that will bite the dust. Like a long line of dominoes they have fallen: Rwanda, Liberia, Ghana...now Congo and Ethiopia are only hanging on by a thread....and next, Uganda joins the list. The headlines announce fraud, corruption, deceit. And meanwhile the children languish, on streets, in orphanages, two or three to a bed. What I don't understand is why there is a need to traffic children for adoptions. Greedy lawyers shouldn't need to connive their way into stealing children. For goodness sake, there's enough orphans to go around. How do we define an orphan? That is the big question. UNICEF defines an orphan as any child who has lost at least one parent. 'Tis true--an orphan of this definition does not necessarily need a new family. Maybe her Dad just needs a job or her Mom needs a place to live. By all means, let's keep these families intact. But I don't define an orphan that way. In my definition, an orphan is any child who has no family, for any reason. Most of the time, that child's parents are still alive. They are just not able to parent their child. Think about it: Are not all American foster children in this category? Every American baby put up for adoption? Death is not the only way to create an orphan. Yet all are the product of brokenness; all need the redemption of adoption. Such is the same on this continent. For every horror story, for every "orphan" child who is manipulated away from her parents, there are a hundred more who are left in hospital beds, in church buildings or bars, or dumped down toilet holes. A hundred more who are the carnage left behind from war, famine, HIV. Many times, brokenness wins, and no poverty-fighting program is going to save that family. But maybe, just maybe, the child can be saved. Yet instead of salvation, in comes the dollar signs and the prestigious positions, and the rescue operation turns into lucrative business. Meanwhile, a child still cries herself to sleep. And no mother ever comes. I feel ripped in two. I see my children, my beautiful children, asleep in their beds--fed, kissed, content, hopeful. I want to tell you their stories, because it would help you to love adoption more, and give you the confidence that yes! adoption is a wondrous thing--but those stories are for them alone to tell. So instead you must trust me when I tell you that adoption was the only hope for my children....and that there are millions more out there just like them. I look at my children and I want to say to you, YES! Please give the chance of a family to one more orphan! But instead, I find myself afraid. I feel privileged, with all my adoptions, that I have had the absolute confidence that I know everything there is to know about my children's stories. Though each process cost me much blood, sweat, and tears, I am positive no one received any unjust compensation. But can I give you my assurance that you would have the same confidence if you embark on this journey? I just don't know. It shouldn't be this way! I must trust in God's justice for those who seek to exploit the least of these, because otherwise the anger will consume me. In the midst of the stories of adoption fraud and corruption, remember this: The orphans are still there, millions of them. Ethical international adoptions are still possible if you are very, very careful. Do not allow cynicism and fear to keep you from considering this incredible journey. There are beautiful bright spots, in places such as Forever Angels, where Lily came from. Forever Angels is not only the best-run orphanage I have seen, but it seeks, first and foremost, to reunite families. They do everything they can--donate formula, provide jobs, help with housing--whatever it takes--to keep families together. If that doesn't happen, then--and only then--do they look for adoptive families. Yet even with these protective measures, they have dozens of children available for adoption. Only a very few will ever get families. If you are a resident of Tanzania--especially a citizen--will you consider adoption in a new way today? If you need a little encouragement, you need to watch this video from Forever Angels. And even if you don't live here (and thus don't qualify to adopt in Tanzania), watch it anyway....because I promise, it will make your day. Which is something you might need after reading this post. Note added July 2016: Shortly after writing this post, my whole view of international adoption was turned upside down. Please read the series I wrote after months of research. Imagine what it would look like for an American church to hire their staff with the same priorities that they chose missionaries to financially support. First of all, a Children's Pastor would definitely be out. Not strategic enough; he's only supporting the children of believers. Youth Pastor? Also out, unless he targets neighborhood kids. How about a Music Pastor? Or Pastoral Counselor? Nope. Those are just a support roles. Not enough front-line ministry. Administrative Pastor? Receptionist? Good heavens. We could never dream of paying someone for those kind of inconsequential support roles. How about a Preaching Pastor? Well.....that's if-y, but he probably doesn't make the cut either. After all, he's only feeding the Body. Most of the time, he's not actually reaching the lost. So that pretty much leaves only the positions of Community Outreach Pastor or Evangelist. Yet how many American churches even have those paid positions? I'm not suggesting that churches go about firing two-thirds of their staff. I just want to point out a bit of a double-standard. Recently, a friend told me, Oh, I could never consider taking a position at Haven of Peace Academy. I know my church would never take me on for a support role. And from a current teacher at HOPAC, We love what we do at HOPAC, but we feel like our supporters just want to see pictures of the street kids ministry, even though that only takes up two hours of our week. And from another teacher when hosting a short-term team: The team gets most excited about the ministry to the poor kids. They don't seem to understand the importance of reaching HOPAC kids. Let me introduce you to the class system among missionaries. Who is on the A-List? Well, that would be the Church Planters. Among unreached people groups gives you A+ status. Pastoral Trainers and Bible Translators might be able to squeak by with an A. The B-List? Doctors and other health workers, community development, poverty alleviation, ESL workers. The C-List? Administrators, missionary member care, MK teachers, or anyone else considered "support." This is definitely not our imagination, and any missionary I know will confirm it. When trying to raise support for our years at Haven of Peace Academy, we called and sent information packets to over 200 churches in California. We heard back from two. Churches told us, over and over again, Sorry, but that ministry doesn't fit into our strategy. When our ministry changed to Pastoral Training, we had churches calling us. It was nice. But frankly, kind of frustrating. We didn't switch ministries so that we would become more popular with churches. We switched because that's where God was leading us. But the truth is, we don't consider Pastoral Training to be any more strategic, or any more exciting, than Haven of Peace Academy. HOPAC is training the next generation of Tanzania's leaders in a biblical worldview. Over 50% of HOPAC's students are Tanzanian, most from influential families. Perhaps equally, or even more important, HOPAC is enabling missions in Tanzania. Young Life and SIL/Wycliffe have established their East African headquarters in Dar because of HOPAC! Dozens of other organizations are able to minister here as well. Oh come on, I can hear you saying. Can't all those families just homeschool? Yes, if they had to. A lot of missionary families don't have another choice. But imagine trying to homeschool your kids, and simultaneously, become fluent in another language, and learn to drive, shop, cook, clean, pay bills, play, and rest in an entirely different way. Without any homeschool groups or co-ops or craft stores. Sound fun? Look at it this way. You can either financially support a missionary mom to (possibly reluctantly) homeschool her four kids, or you can financially support a missionary teacher (who's called to it) to teach 25. It's not like the mom is going to sit on her hands all day. She'll be right out there working in ministry. I'm particularly passionate about MK education, but I could say the same things for all the other so-called "support" roles in missions. I just wrote my last three posts about the often harsh realities of life overseas. Yet when Christians stand up and say, I'm called to missionary care! I'm called to teach MK's! I'm called to missions administration!, the churches say, Well, sorry, you don't fit in our strategy. We'd rather get behind the exciting church planters and the pastoral trainers. Except, we expect them to do it without all the other people they need to be successful. I sit on the board of governors at Haven of Peace Academy. At almost every meeting, we bang our heads against the wall, asking ourselves, How are we going to get enough teachers? Every year, it's a problem. Every year, we pray and plead and try to get more creative with recruitment. But you want to know the reality? Churches are just not as interested in supporting teachers. Heck, even missions organizations are not as interested in supporting teachers. Listen, I'm all about strategy in missions. But can we expand our idea of what strategy means? Missionaries, as an extension of the Church, must function as the Body of Christ. Could the American Church function by only hiring evangelists? I realize that missions has different goals--we are working ourselves out of a job; we are doing everything we can to replace ourselves with national believers. But to get there, we need the Body of Christ. The legs can't do anything without the arms and fingers and neck. So go out today and find your nearest missionary accountant or counselor or MK teacher. Remind them they are never second-class. For the next school year, HOPAC is still looking for an Operations Manager, an Elementary Teacher, a P.E. teacher, a Librarian, and a Special Needs Teacher.